You guys, you are going to be blown away at how delicious these air fried chicken wings are! 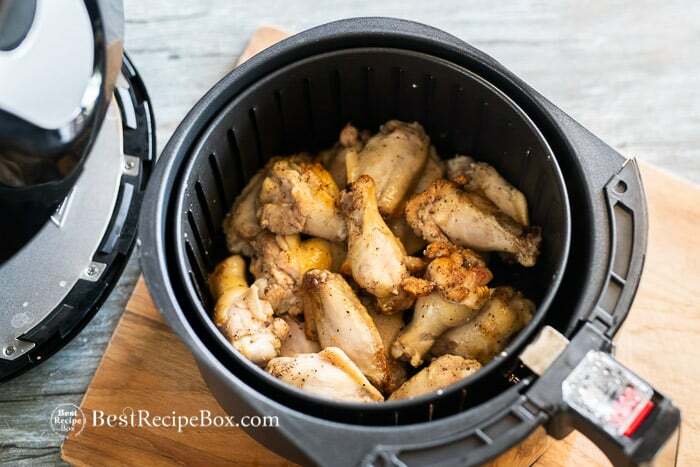 Wow, our air fryer chicken wings recipe does not use any oil at all. The chicken wings have plenty of oil already and just enough to cook the crispy in the air fryer. It’s incredible how quick and easy air fried chicken wings are to make. The only real effort is seasoning the chicken wings with salt and pepper. 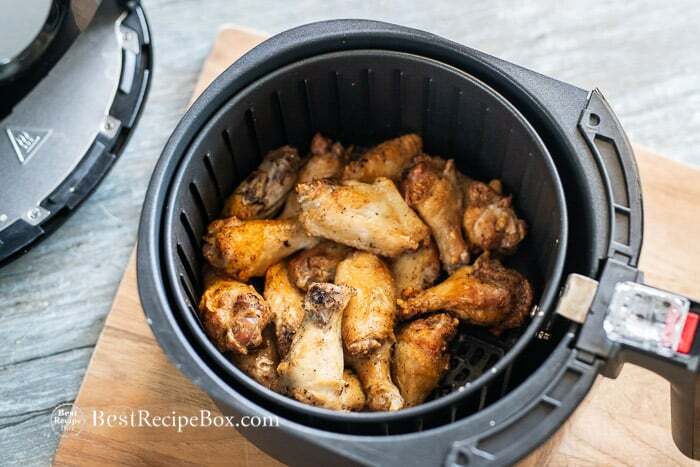 Then press a few buttons on the air fryer and within minutes you have the best chicken wings ever. 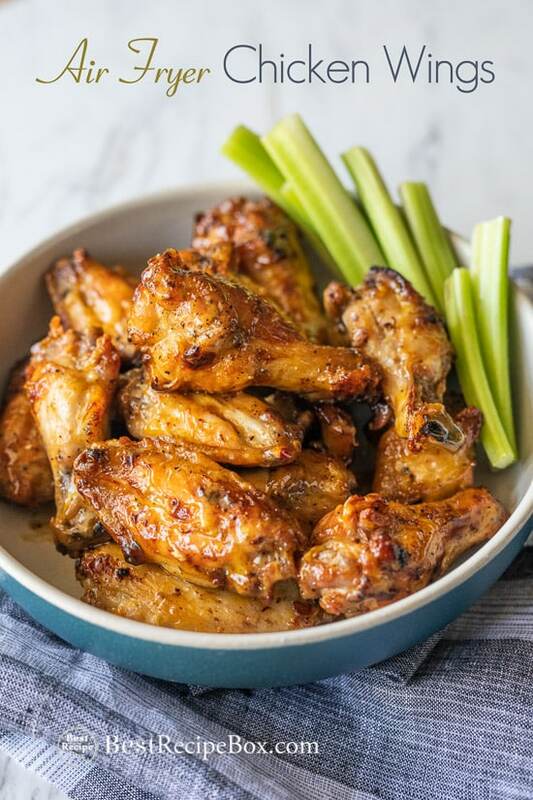 If you’re looking for a delicious and quick recipe for Game Day or Super Bowl chicken wings, this is it! Once you have the chicken wings made in batches, you can add what ever sauce you like. In fact, you can totally be a chicken-wings-making-machine by having all your sauces ready. Before you know it, you’ll be cooking up batches and sauces them up. You might need two air fryers because you probably won’t be able to keep up at a Super bowl party. Everyone will be devouring these so fast, you can’t keep up. Season wings with salt and pepper. 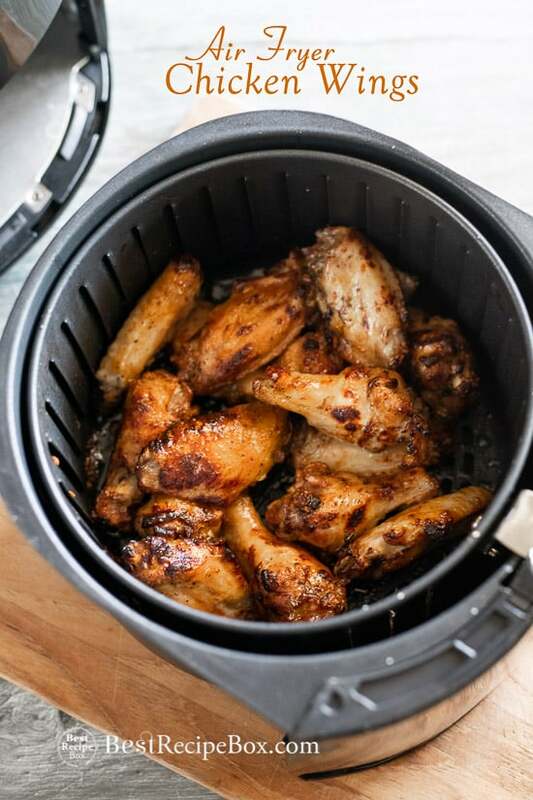 Add wings to air fryer basket. Then Air Fry the chicken wings. First Toss : Air Fry then toss and shake the chicken wings. Third Toss : Add chicken wings to a bowl, and coat with your favorite sauce. Then air fry one last time for a few minutes. Done! Finished and absolutely delicious! No oil and so much healthier. 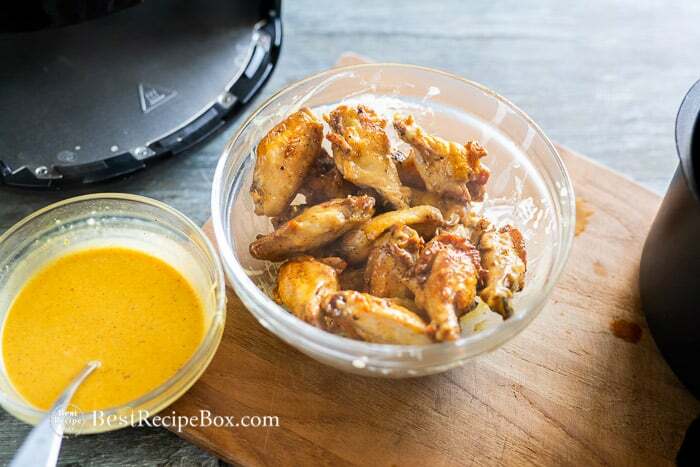 Our honey mustard sauce recipe for wings is super easy, it’s takes 5 minutes. Maple Bacon bourbon sauce is fantastic! Spicy garlic sauce is addictive! Sriracha chicken wing sauce is for spice lovers! We cooked the 2 lbs. of chicken wings in a 3.4 qt. Air Fryer. For that size of air fryer, 2 lbs. is about the max without overcrowding the air fryer. If you have a larger size of air fryer, you can probably cook larger batches. Adjust cooking time for thicker or thinner chicken wings. Some brands of Air Fryers will cook slower or faster than others, adjust accordingly. Rinse and pat dry chicken wings. Season with salt, pepper, and optional garlic salt. Air Fry at 400°F for 30 minutes, flipping about 3 times while cooking. If using a sauce, toss with a little sauce, then air fry for another 4 minutes (otherwise just cook the 30 minutes or until the chicken wings are golden). If using a sauce, toss with extra sauce after cooking or serve sauce on the side for dipping. Shake several times for even cooking. If using a sauce, it is added in just at the end, otherwise it will usually burn before the chicken wings are cooked. 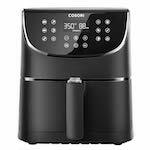 If cooking in multiple batches, the first batch will take longer to cook if Air Fryer is not already pre-heated. You have no idea how obsessed I am with this technique. It’s going to be a hit on Super Bowl sunday and make life so much easier. Hi Joseph, yeah these cook up so simple that it’s so easy to make them batches for parties. Enjoy! thanks for the amazing step by step photos! This was so easy and can’t believe it uses no oil! Glad you enjoyed the recipe Harris! And the photos too. We just tried these and can’t believe how amazing and crispy they turned out! We sauced it with our favorite bottle of bbq sauce. Will be making it again! Thanks Vera! And that sounds awesome with the bbq sauce! I hope you put more Air Fryer recipes on your site!! I’ve tried so many different techniques for chicken wings and deep frying has been my favorite but it requires too much oil. 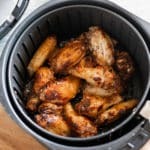 I tried this air fryer method and it’s amazing! The wings came out just as good but uses no oil! Air frying is the way to go! 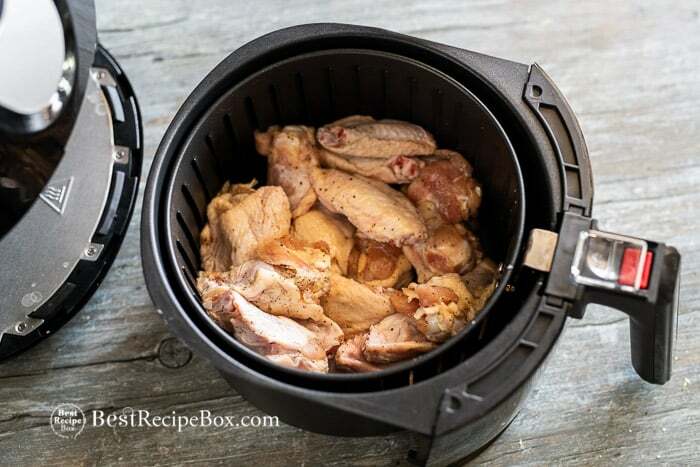 Making healthy Air frying chicken wings is easy and truly amazing! 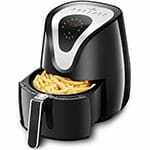 This air fryer is super innovative! 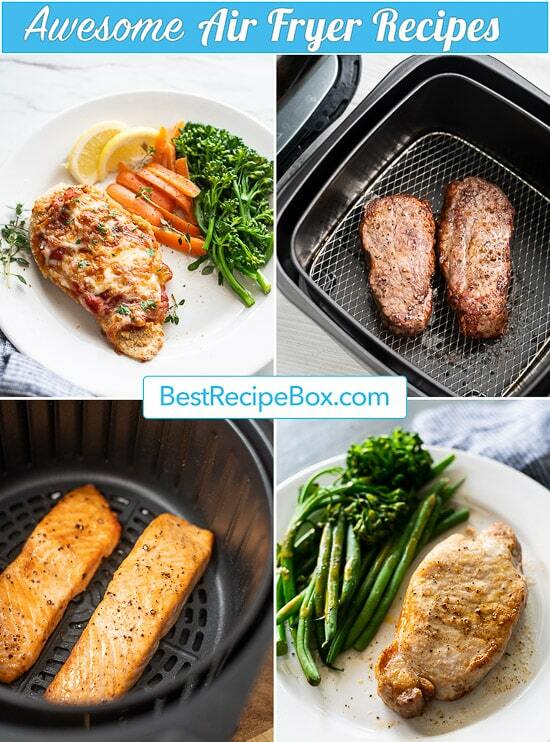 Such a great way to “fry food” and keep it healthy! Will definitely be using this recipe again for my Super Bowl party. 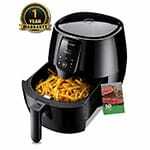 Hi Betsy, glad you’re enjoying the air fryer and have fun eating chicken wings for your Super Bowl party! 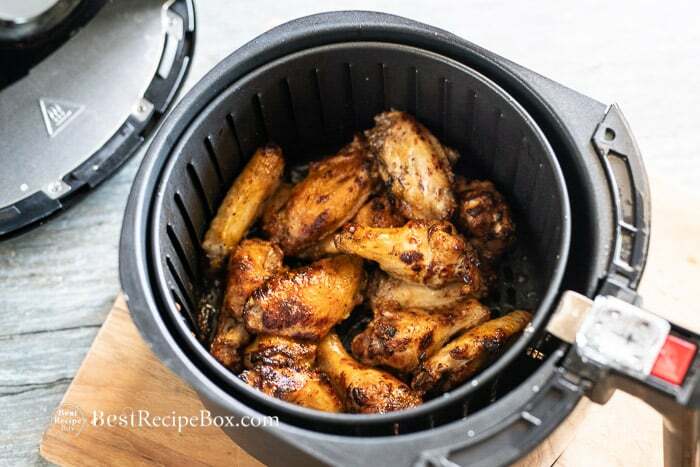 Just tried this recipe out since I recently bought an air fryer and this has now become my new favorite wing recipe. 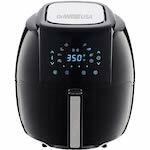 I can’t wait to try out the rest of your air fryer recipes! I added some bbq sauce and these were quick and perfect!